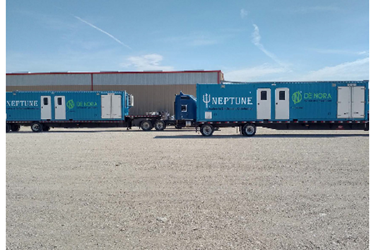 De Nora, a leading designer of safe, innovative, and sustainable water disinfection and oxidation, filtration and electrochlorination solutions, has completed delivery of eight ClorTec® mobile disinfection systems to treat frack water at different sites in the Permian Basin. As part of the hydraulic fracturing process to release onshore oil and natural gas from shale, water must be disinfected shortly before going downhole to prevent growth of anaerobic, iron-consuming bacteria and other microorganisms. 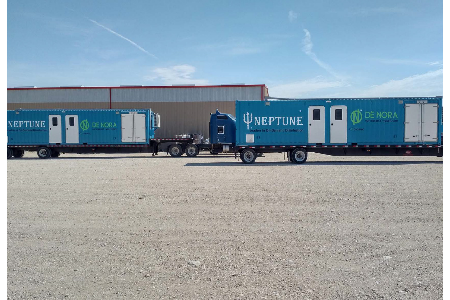 De Nora worked in conjunction with its partner, Neptune Solutions Company to provide fully equipped disinfection trailers, each with a ClorTec® CT-DN on-site hypochlorite system, tanks, dosing pumps, analyzers, HVAC and a small lab. Each containerized system has the capacity to generate up to 1,500 pounds per day of a 0.8% sodium hypochlorite disinfection solution, a chlorine equivalent, using three common consumables: salt, water and electricity. This is sufficient to treat upwards of 235,000 barrels of frack water per day, per unit. Since 1995, ClorTec® on-site sodium hypochlorite generation systems have been designed, delivered and installed to disinfect municipal drinking water and industrial process water at more at than 3,500 sites around the world. De Nora’s most recent electrochlorination innovation, the ClorTec® DN unit used in the trailers offers simple operation and maintenance as well as performance and safety advantages and employs De Nora DSA® bipolar electrodes for highly efficient salt and power usage. Generating disinfectant on-site produces a less hazardous hypochlorite solution than bulk hypochlorite and eliminates the need to transport hazardous materials. Additionally, on-site provides protection against chemical price fluctuations and avoids costly chemical containment systems and risk management planning. The unique design of the ClorTec® DN electrode/cell rapidly and effectively removes hydrogen, the only by-product generated by the system. De Nora is an Italian multinational leader in sustainable technologies that offers energy saving products and water treatment solutions. Globally De Nora is the pre-eminent provider of electrodes for electrochemical processes (for clients in the Chlorine & Caustic, Electronics & Surface Finishing, Pool Electrochlorination and Specialties sectors) and is among the leaders in technologies and processes for the filtration and disinfection of water (for clients in the industrial, municipal water and wastewater, power and energy, and marine sectors). The Company has grown organically by continuous innovation and externally through major acquisitions in the USA, United Kingdom Japan, and Italy. It serves clients in 119 countries and has a physical presence in 11 countries worldwide with 19 offices, 12 manufacturing facilities, and three research & development centers in Italy, the USA and Japan. The Group intellectual property portfolio currently contains 355 patent families with more than 3,000 territorial extensions and about 90 trademarks all over the world.